If you want to find quiet mountain roads in Taiwan, head over to Route 169 in the foothills of Alishan, a famous tourist destination. This is a well surfaced road with steep climbs and spectacular views of mountains, deep river valleys and tea plantations. It is blessedly devoid of tour buses, the scourge of many scenic roads in Taiwan if you are a cyclist… or a car driver… or for that matter anyone that is not actually in a tour bus. Our primary reason for coming to Taiwan was to compete in the Taiwan KOM. 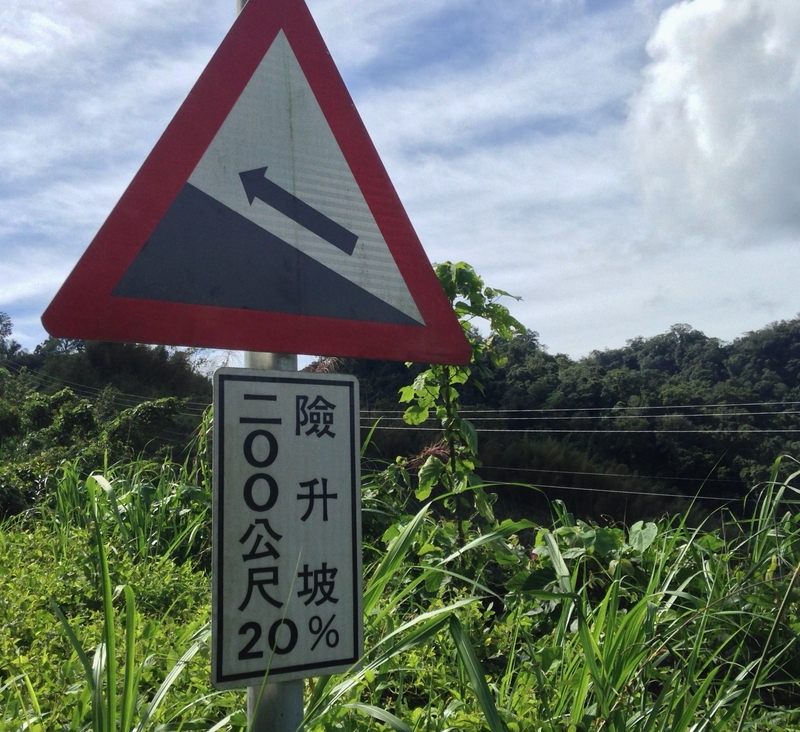 Lillian has written an account of the race here: Taiwan KOM 2015. 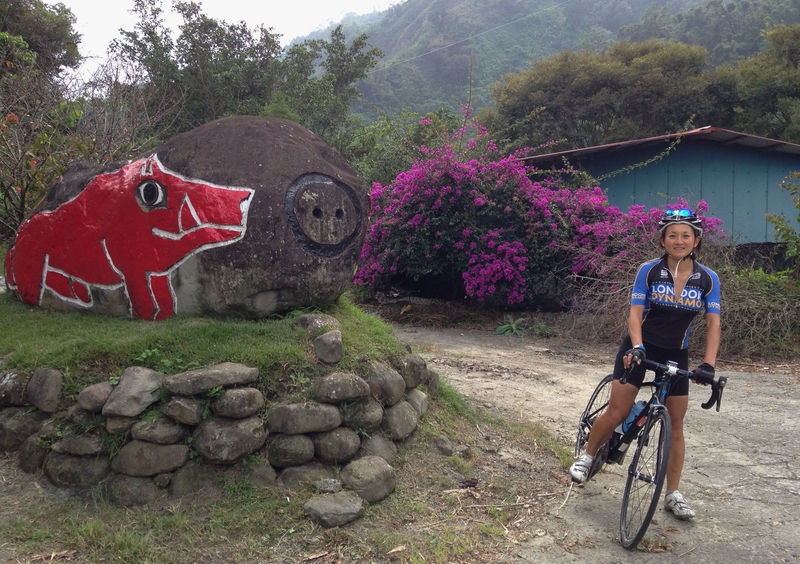 We had a few more days in Taiwan after the race and drove to the Alishan region hoping to find some good cycling. The drive took us from Hualien initially along the Taiwan KOM route which took about 3 hours to drive up; it really is a really long climb. We also had a flat tyre which caused a two hour delay and offered a good opportunity for me to practice my Mandarin speaking to the car rental company! Ten hours after leaving Hualien we arrived in the dark at the Tea Cloud B&B. This is a guesthouse 1.5km below Shizhao, a small town on Route 18 which is the main road up to Alishan. 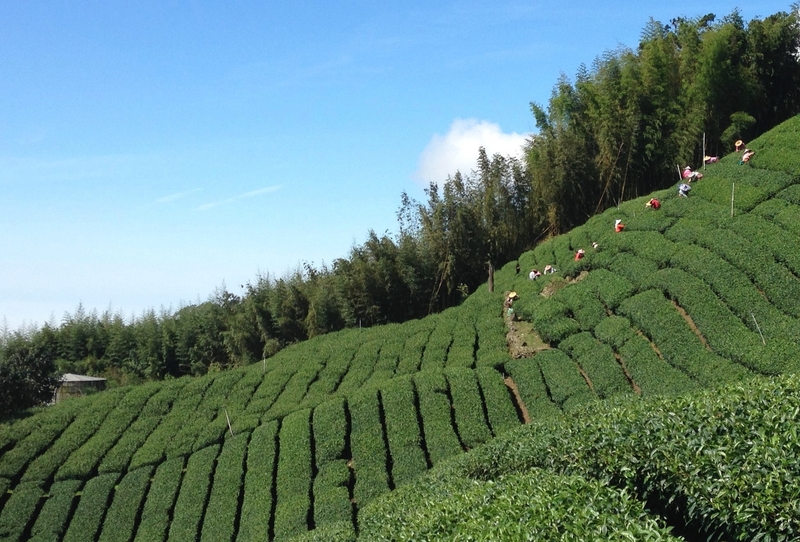 The next morning, we woke to a beautiful clear day and a great view of the surrounding tea plantations and mountains. Shizhao lies roughly in the middle of Route 169 which is 51km long end to end. 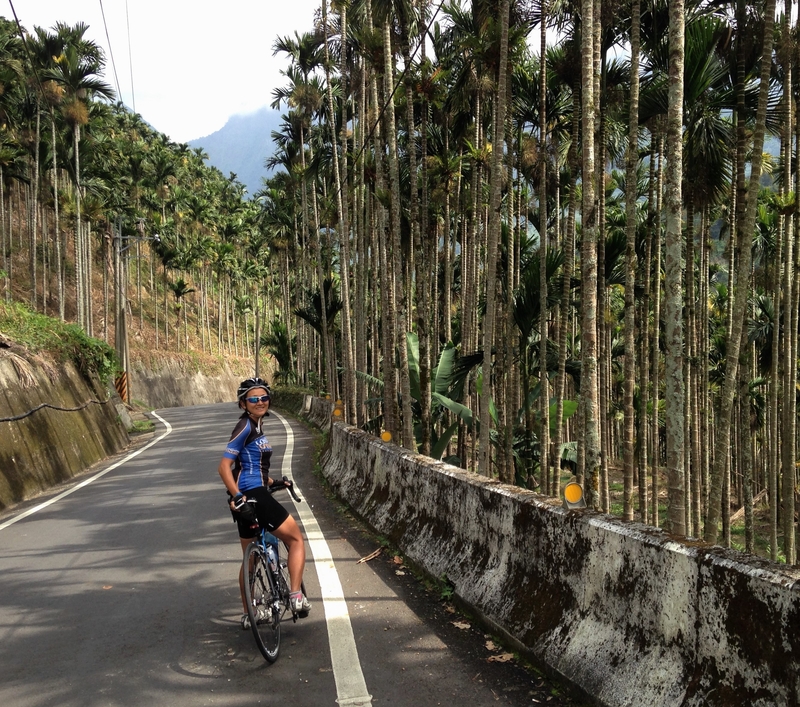 On the first ride we headed north from Shizhao and saw spectacular views of tea and betel nut plantations. We rode in the other direction on our second ride and went through some beautifully situated Zou villages, the Zou (鄒) being the indigenous mountain people. Each ride was about 60km with c.1700m of ascent. 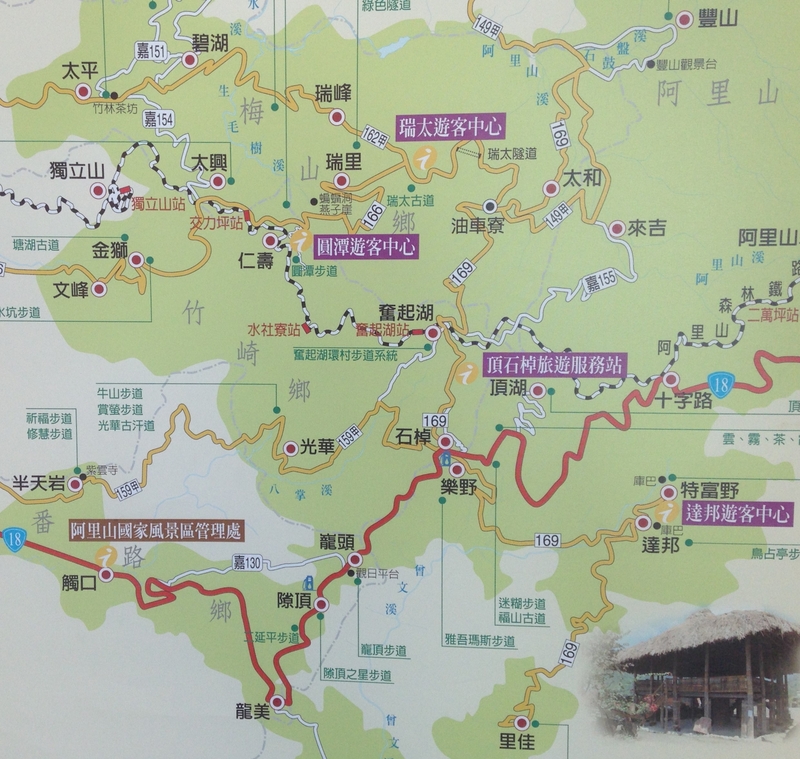 Here is some more information for anyone wanting to ride Route 169 or cycle the climb to Alishan (阿里山). First a map of the area. Shizhao (石棹) is where the yellow 169 crosses the red road. The road starts by going through the tea plantations around Shizhao. It than passes through Fenqihu (奮起湖), which is now the last stop of the narrow gauge railway that used to go all the way to Alishan; since a typhoon in 2009 it has stopped in Fengqihu. 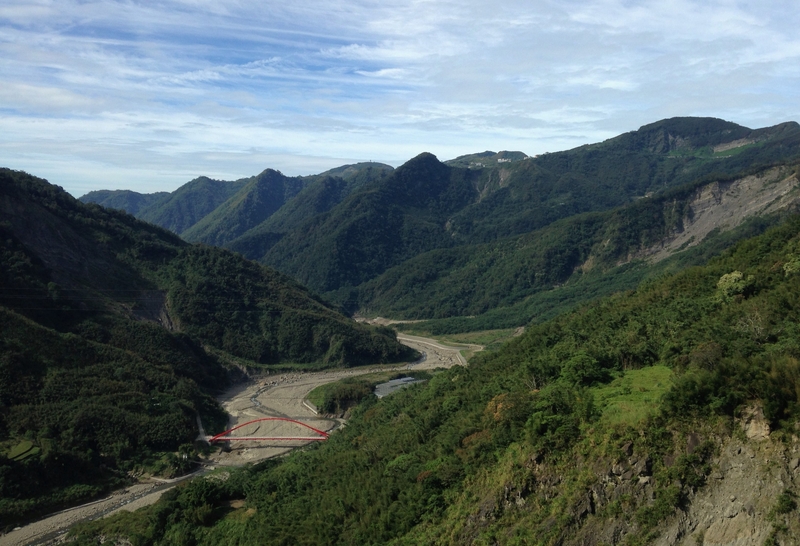 The railway up to Alishan is due to reopen at the end of 2015. As most of the cars and the small number of tour buses (there’s no escaping them!) stop at Fengqihu, the road thereafter becomes quieter. There is a 250m ascent which is followed by a steep descent into a valley filled with tea and betel nut plantations and surrounded by mountains wreathed in cloud. Betel nut (bin-lang) is a mild narcotic which gives chewers a characteristic reddish-brown gloop around their teeth. The betel nut trees, shown below, are very distinctive. From the end of Route 169, rather than coming straight back, it is worth returning via Route 149A (甲) then at Laiji (來吉) following Route 155. This is a small but good road climbing 800m through bamboo forest and trees. Laiji has an interesting wild boar related motif running through it, as seen in the multitude of painted rocks. Note that the weather in the Alishan region seems to cloud in during the afternoon; apparently that is why is a good region for growing tea. However, it does means it is worth starting early. This is a there and back again route and is very hilly. You don’t need to read Chinese to be able to understand the sign below. Lillian was chased by dogs when cycling through one of the villages on the way out so we were a bit worried about running the gauntlet on the way back. Anti-climatically all the dogs seemed to have gone to sleep in the midday heat and we just got a few barks. As mentioned, Shizhao sits on the main road to Alishan; however, as tour buses started going by from about 7am we decided to get up early, and set off to climb it at 5.30am. We rolled upwards in the pre-dawn stillness until the sun started to rise 15 minutes later. It was cool experience to be climbing on a wide, smooth road with almost no traffic but the climb itself was not that challenging. 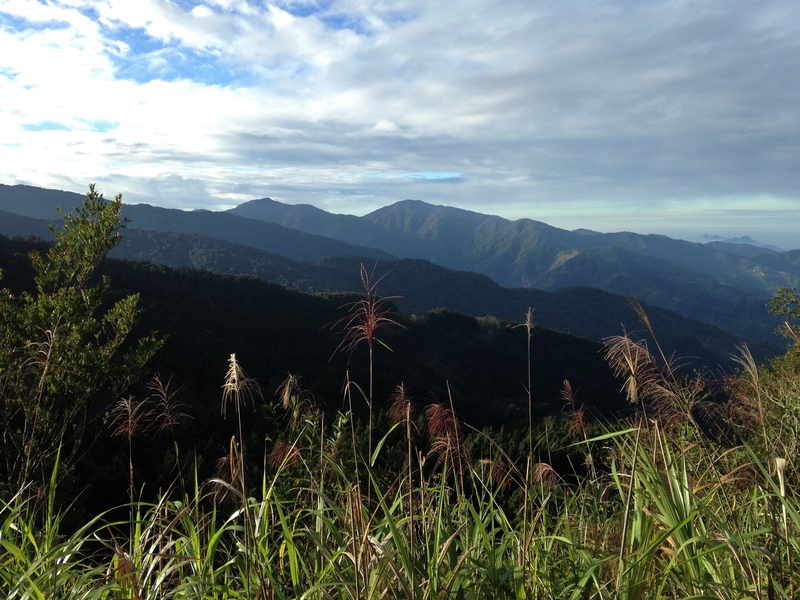 From Shizhao we climbed 950m over 27km, with most of the ascent being in the last 10km. There were some nice views as the sun came up; the picture below was taken quite close to the top of the climb. At the ‘top’ there are some toll gates where we had to pay NTD150 to turn off Route 18 and enter Alishan village. 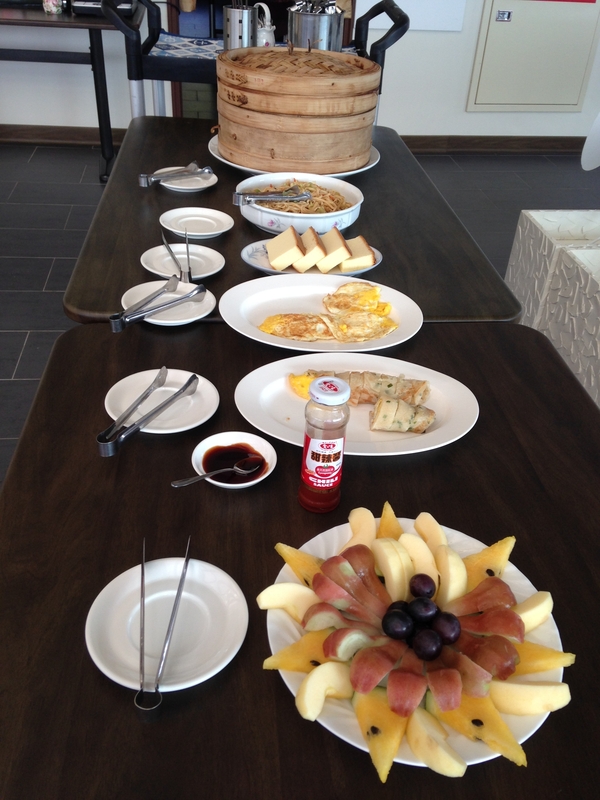 We didn’t bother doing this as we had to back at our guesthouse by 8.30 for breakfast. The descent was great fun and by the time we got down we were hungry enough to do justice to an enormous breakfast, shown below. This was just for the two of us and the owner! Route 18 climbs for a further 20km beyond Alishan (which is at 2,000m) to a high point at 2,610m which should give some good views of Yu Shan (3,952m), the highest peak in Taiwan. Something to check out if we come back.